If you need to know more about how to communicate your campaign to others, this Media Training Toolkit will help you. It introduces basic ‘need to know’ information about telling your stories to new audiences using photography and social media, and gives advice on engaging with mainstream media. It is full of handy hints and tips, from how to prepare for interviews and write a press release, through to advice about photographing people, and do’s and don’ts for social media. 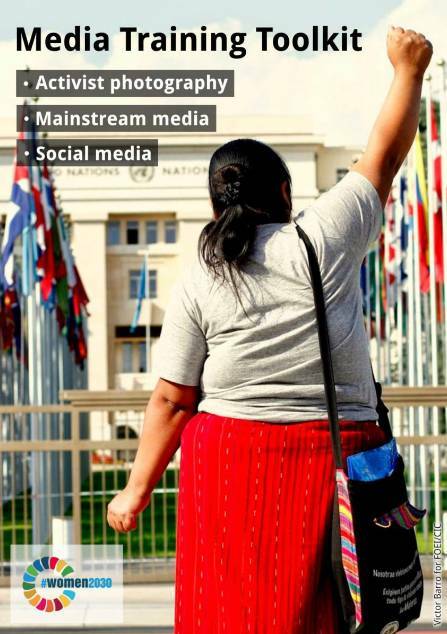 Published by #women2030, the toolkit is intended as a resource to help civil society organisations and movements in their outreach, advocacy and campaigning work, so that they can effectively advocate for gender equality and women’s priorities and positions. #women2030 is a programme that aims to achieve gender-responsive implementation of the Sustainable Development Goals (SDGs) by engaging women and gender-focussed organisations and movements around the globe. It is led by WECF International, Global Forest Coalition, Women Environmental Programme, Gender and Water Alliance, and Asia Pacific Forum on Women, Law and Development. We hope it can be a useful tool for members and partners alike. It is now available online in English, Russian and Spanish and can be downloaded here. Russian media toolkit can be downloaded here, French here – and Spanish here.